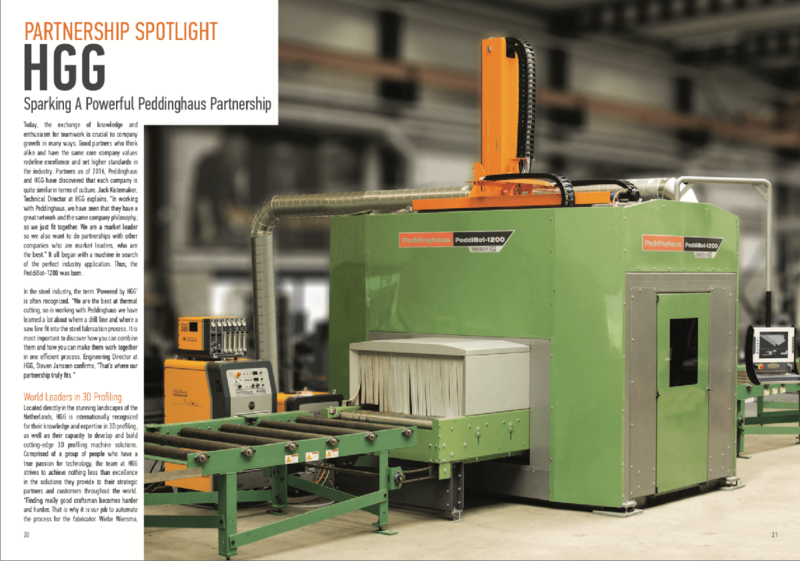 In the latest edition of PeddiNews, issue 58 of the quarterly magazine by our American partner Peddinghaus, HGG is in the Partnership Spotlight. In 2016, HGG and Peddinghaus discovered each other as partners who share the same company philosophy. The first result of the collaboration is the PeddiBot-1200, which is powered by HGG. You can read it here as a pdf (it starts from page 20) but we thought it would be nice to write it down here below. Today, the exchange of knowledge and enthusiasm for teamwork is crucial to company growth in many ways. Good partners who think alike and have the same core company values redefine excellence and set higher standards in the industry. Partners as of 2016, Peddinghaus and HGG have discovered that each company is quite similar in terms of culture. Jack Kistemaker, Technical Director at HGG explains, “In working with Peddinghaus, we have seen that they have a great network and the same company philosophy, so we just fit together. We are a market leader so we also want to do partnerships with other companies who are market leaders, who are the best.” It all began with a machine in search of the perfect industry application. Thus, the PeddiBot-1200 was born. 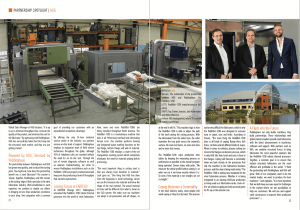 Located directly in the stunning landscapes of the Netherlands, HGG is internationally recognized for their knowledge and expertise in 3D profiling, as well as their capacity to develop and build cutting-edge 3D profiling machine solutions. Comprised of a group of people who have a true passion for technology, the team at HGG strives to achieve nothing less than excellence in the solutions they provide to their strategic partners and customers throughout the world. “Finding really good craftsman becomes harder and harder. 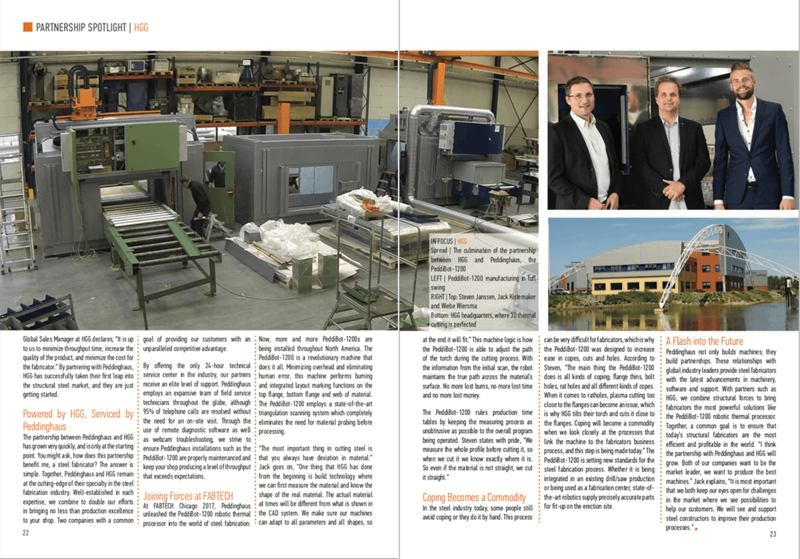 That is why it is our job to automate the process for the fabricator. Wiebe Wiersma, Global Sales Manager at HGG declares, “It is up to us to minimize throughput time, increase the quality of the product, and minimize the cost for the fabricator.” By partnering with Peddinghaus, HGG has successfully taken their first leap into the structural steel market, and they are just getting started. The partnership between Peddinghaus and HGG has grown very quickly and is only at the starting point. You might ask, how does this partnership benefit me, a steel fabricator? The answer is simple. Together, Peddinghaus and HGG remain at the cutting-edge of their specialty in the steel fabrication industry. Well-established in each expertise, we combine to double our efforts in bringing no less than production excellence to your shop. Two companies with a common goal of providing our customers with an unparalleled competitive advantage. By offering the only 24-hour technical service center in the industry, our partners receive an elite level of support. Peddinghaus employs an expansive team of field service technicians throughout the globe, although 95% of telephone calls are resolved without the need for an on-site visit. Through the use of remote diagnostic software as well as webcam troubleshooting, we strive to ensure Peddinghaus installations such as the PeddiBot-1200 are properly maintenanced and keep your shop producing a level of throughput that exceeds expectations. At FABTECH Chicago 2017, Peddinghaus unleashed the PeddiBot-1200 robotic thermal processor into the world of steel fabrication. Now, more and more PeddiBot-1200s are being installed throughout North America. The PeddiBot-1200 is a revolutionary machine that does it all. Minimizing overhead and eliminating human error, this machine performs burning and integrated layout marking functions on the top flange, bottom flange and web of material. The PeddiBot-1200 employs a state-of-the-art triangulation scanning system which completely eliminates the need for material probing before processing. “The most important thing in cutting steel is that you always have deviation in material.” Jack goes on, “One thing that HGG has done from the beginning is build technology where we can first measure the material and know the shape of the real material. The actual material at times will be different from what is shown in the CAD system. We make sure our machine can adapt to all parameters and all shapes, so at the end it will fit.” This machine logic is how the PeddiBot-1200 is able to adjust the path of the torch during the cutting process. With the information from the initial scan, the robot maintains the true path across the material’s surface. No more lost burns, no more lost time and no more lost money. In the steel industry today, some people still avoid coping or they do it by hand. This process can be very difficult for fabricators, which is why the PeddiBot-1200 was designed to increase ease in copes, cuts and holes. According to Steven, “The main thing the PeddiBot-1200 does is all kinds of coping; flange thins, bolt holes, rat holes and all different kinds of copes. When it comes to ratholes, plasma cutting too close to the flanges can become an issue, which is why HGG tilts their torch and cuts it close to the flanges. Coping will become a commodity when we look closely at the processes that link the machine to the fabricators business process, and this step is being made today.” The PeddiBot-1200 is setting new standards for the steel fabrication process. Whether it is being integrated in an existing drill/saw production or being used as a fabrication center, state-of- the-art robotics supply precisely accurate parts for fit-up on the erection site.